The multinational leader in the manufacture and distribution of surfaces for architecture and design, Cosentino forms an alliance with the tennis player considered the best Spanish athlete of all time, Rafa Nadal to develop various collaborative and promotional actions. As a result of this agreement, the Cosentino Group has become a sponsor of the “Rafa Nadal Academy by Movistar”, the tennis academy that the athlete will open soon in Manacor (Majorca, Spain) to promote the values of sport among youngsters. Cosentino will supply its flagship products, Silestone® and Dekton® – which are world leaders in their respective categories – for the construction of this high-performance sports complex, on which work is scheduled to commence in autumn this year. UK, 28 October 2014 – The world leader in the production and distribution of innovative surfaces for architecture and design, the Cosentino Group, is entering into a collaboration agreement with tennis player Rafa Nadal, considered the best Spanish athlete of all time. As part of this alliance, Cosentino will develop various promotional and support actions together with Nadal. The first of these actions will be to sponsor the “Rafa Nadal Academy by Movistar” project, the tennis academy that the athlete will open soon in his hometown of Manacor (Majorca, Spain) to promote the values of sport among youngsters. The Academy, on which work is scheduled to commence in autumn this year, is a comprehensive educational and sports project dedicated to teaching, shaping values, promoting tennis among children, and searching for new talent. The complex will consist of various spaces, such as a school, the International Tennis Centre and a fitness centre, among others. It will also be home to the headquarters of the Rafa Nadal Foundation and a Museum dedicated to Rafa Nadal’s career. The Cosentino Group will support this high-performance educational and sports complex via its flagship products Silestone®; world leader of quartz surfaces, and Dekton®; the Group’s new ultra-compact surface that is conquering the international architecture and design markets. It is specifically the material Dekton by Cosentino® that will be mainly used for the various facilities of the “Rafa Nadal Academy by Movistar”. Façades, flooring and other cladding created with this innovative product will grace the spaces of the Academy. Silestone® will also be used in areas such as the kitchens and bathrooms of the complex, the design for which has been created by two architectural firms from Majorca and Barcelona. 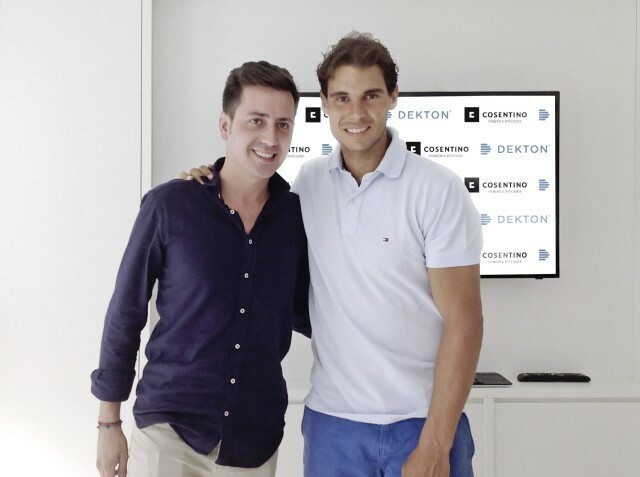 According to Santiago Alfonso, the Cosentino Group’s Director of Marketing and Communications, “collaborating with Rafa Nadal is a source of great pride for us all. Nadal is so much more than an exceptional athlete. His desire to achieve, his strength and ability to lead are some of the values that have made him a global celebrity, recognised and admired everywhere. For Cosentino, where we have always committed ourselves to continually improve, innovate and search for that leadership to succeed, this partnership represents great satisfaction for all our employees, partners and customers worldwide”. “The fact that this union begins precisely with the sponsorship of the Academy perfectly reflects our common understanding of all those values. This really can be called a Social Responsibility initiative, as it focuses on youngsters in our society. For us it is an honour to work together on this educational project, and for our best products to be present in all its facilities and spaces”, says Alfonso. For his part, Rafa Nadal has expressed his enthusiasm with this new alliance with “a Spanish company that is a world leader in its sector, encompassing a series of values with which I fully identify, in addition to supporting sport in Spain for a long time. I am sure that this collaboration project with Cosentino, starting with its help in the construction of the Academy, will be a long-lasting one and be productive for both parties”. This collaboration agreement with Rafa Nadal, reached with the participation of Evolution BCN, continues the active policy of partnerships and sponsorships that the Cosentino Group has maintained in recent years of elite sports. It was also a major achievement when Silestone® was the first Spanish brand to produce a spot to be shown at the world’s biggest advertising event, the Super Bowl in 2005. Since that same year, Silestone® has also been one of the main brands of the NBA Houston Rockets team. In addition, Silestone® was a personal sponsor of the Formula 1 world champion, Fernando Alonso, for four seasons. And since June 2011, and via its Dekton® brand, Cosentino is also a personal sponsor of the four times world champion for motorcycle racing, Jorge Lorenzo.